Small system with big aspirations. Zotac has a new mini PC for gamers, one that packs Polaris graphics inside. It's called the Magnus ERX480, and as the model name suggests, it wields an AMD Radeon RX 480 graphics card with 4GB of GDDR5 memory inside. The Magnus ERX480 measures 8.27 x 7.99 x 2.45 inches, or roughly twice the size of a standard Intel NUC system. Zotac makes use of the additional space by giving its mini PC a fairly stout GPU. 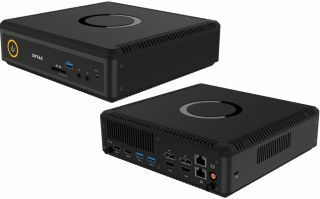 Along with other hardware and features, Zotac is pitching this thing as the world's first AMD Radeon powered mini PC for VR gaming. There are three variants, the regular Magnus ERX480, a Plus model that comes populated with additional hardware, and a Windows 10 version that adds an OS. Both versions sport an Intel Core i5-6400T processor clocked at 2.2GHz, two SO-DIMM slots supporting up to 32GB of DDR4-2133 memory, 2.5-inch SATA 6Gbps and M.2 SATA slots (one each), and a 3-in-1 memory card slot. External connectivity consists of a pair of USB 3.0 ports, two USB 3.1 ports (Type-C and Type-A), two USB 2.0 ports, dual GbE LAN, and separate microphone and headphone ports. You'll also find built-in 802.11ac Wi-Fi and Bluetooth 4.2 connectivity. The Plus model comes with 8GB of DDR4 RAM, a 120GB M.2 SSD, and a 1TB hard drive, while the Windows 10 version stacks a preinstalled OS on top of it all. All three models are capable of native 4K output at 60Hz via DisplayPort 1.3 and HDMI 2.0, of which the Magnus ERX480 has two of each. No word yet on when these models will be available or for how much. As a point of reference, a barebones Magnus EN1060 with a GeForce GTX 1060 GPU and Core i5-6400T processor sells for around $1,000.